SAN DIEGO, CA, May 17, 2016 – Clean Edge, a leading cleantech research firm, today released its seventh annual U.S. Clean Tech Leadership Index, which tracks and ranks the clean energy and cleantech activities of the 50 largest metro areas in the U.S. – from electric vehicle and renewables adoption to policy and investment activity. In the 2016 report, the San Diego region ranks #3 in the nation for cleantech leadership, moving up one place from last year. San Francisco and San Jose repeat as #1 and #2. The 2016 edition comes at a time of notable acceleration in the nation’s transition to a clean energy economy, where an increasing number of cities, states, and companies are raising their renewable energy targets, green buildings are becoming the standard, and energy storage and electric vehicles are moving into the mainstream. 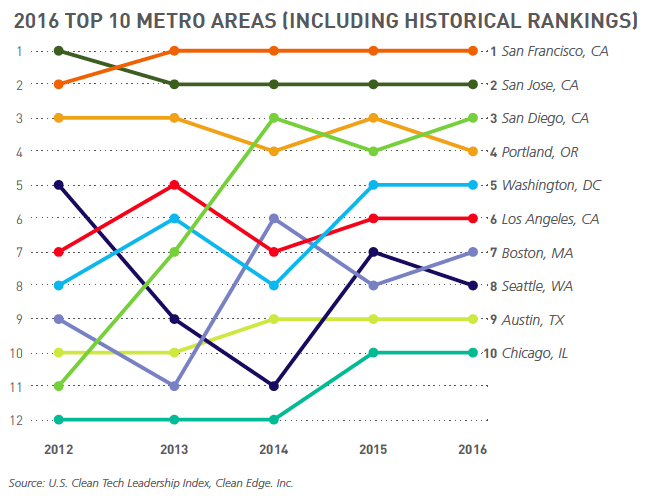 San Diego’s overall ranking as the nation’s #3 metropolitan area for cleantech leadership is determined by its score in a number of categories. The region ranks #3 in Advanced Transportation; #3 in Carbon Electricity and Carbon Management; #5 in Cleantech Investment, Innovation, and Workforce; and #19 in Green Buildings. A free downloadable summary of the 53-page report is available at http://cleanedge.com/reports/2016-US-Clean-Tech-Leadership-Index. Clean Edge, Inc., founded in 2000, is the world’s first research and advisory firm devoted to the clean-tech sector. The company benchmarks and tracks the clean-energy economy by delivering stock indexes, utility and consumer surveys, and regional (state and metro) leadership tracking. These services provide companies, investors, NGOs, and governments with timely research, trending analysis, and actionable insights. Managing director Ron Pernick and senior editor Clint Wilder are co-authors of the widely acclaimed business books The Clean Tech Revolution (HarperCollins, 2007) and Clean Tech Nation (HarperCollins, 2012). To keep abreast of the latest clean-energy trends, or for more information on the company, visit cleanedge.com or follow @CleanEdgeInc.